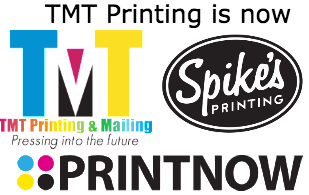 To place an order or get help with a new project at TMT / Spikes Printing & Mailing, enter our online Customer Service Center. To download useful software and find helpful information, search our Resources & Support area. To learn more about us, browse through our Company Information section. An easy-to-use pulldown menu, search engine, and a link to our contact form appear on each and every page. Also, feel free to consult the site map at any time if you're having trouble locating a particular item. If there's anything we can do to improve our site, please let us know. Of course we are more than a website. Please give us a call to talk to one of our friendly and professional staff members.You can find our phone number in the bottom left hand corner of the page, or you can send us feedback at the Contact Us section. ASK ABOUT CUSTOMIZING YOUR OWN PROFESSIONAL VINYL BANNER! Enjoy your visit! TMT Printing & Mailing News You Can Use!